11/14/2017 | LOVE OVER RULES IS LIVE! Thank you to everyone who joined us to celebrate LOVE OVER RULES by Hank Willis Thomas in Annie Alley on November 9! The artwork's important message is for all of us to share. If you weren't able to join us, you can watch a video of Hank and Marc Bamuthi Joseph, Chief of Program and Pedagogy at the Yerba Buena Center for the Arts, in conversation––and the piece in action!––here on YouTube. LOVE OVER RULES is installed on the Salma Family Building at 165 Jessie Street and is best viewed from the corner of Mission Street and Annie Alley, adjacent to the California Historical Society. It is illuminated daily from 12PM–12AM. 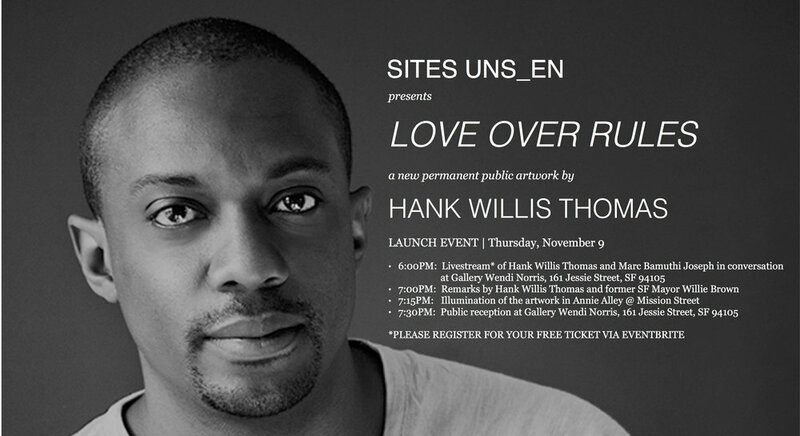 Please join us on Thursday, November 9 to celebrate the launch of LOVE OVER RULES, artist Hank Willis Thomas's first permanent public art installation at The Salma Family Building at 165 Jessie Street! At 6PM, Hank will give an artist talk at the California Historical Society, located at 678 Mission Street in San Francisco. At 7PM, Hank and former SF Mayor Willie Brown will give introductory remarks, followed by the illumination of the artwork in Annie Alley. Register for your FREE ticket to the artist talk via the Eventbrite link below. All are welcome! **Update** 11/5/17 – The artist talk is SOLD OUT, but you can watch just down the street at Gallery Wendi Norris (161 Jessie Street), then join Hank for the illumination of the artwork in Annie Alley at 7PM followed by a public reception at the gallery! Register via Eventbrite below. THANK YOU to everyone who joined us for collage-making with Fallen Fruit, part of the celebration of Local Color. Your incredibly creative work has been incorporated into a digital magazine, San Francisco LOVE Edition #4. Click below to download your copy and please spread the love widely! 7/29/2017 | LEAH ROSENBERG LOCAL COLOR LAUNCH PARTY! Please join us at on Saturday, July 29 from 3–6PM to celebrate the launch of Local Color, artist Leah Rosenberg's new seating and lighting installation in Natoma Street in downtown SF, featuring a participatory #CrochetJam with Ramekon O'Arwisters and collaborative Summer of Love-themed magazine-making workshop with Fallen Fruit! The event will take place on the block of Natoma Street between New Montgomery Street and the back entrance to SFMOMA/3rd Street, along the street and in the rear courtyard of 140 New Montgomery. It's free and open to the public of all ages –– we can't wait to see you there! Please join Sites Unseen and local social practice artist Ramekon O'Arwisters for the next Crochet Jam on Saturday, May 27 at 1PM at the Museum of the African Diaspora, located at 685 Mission Street in San Francisco. This event is free and open to the public of all ages. Come learn to crochet with others from the local community –– the collective work will eventually be displayed and translated into a permanent mosaic piece in the neighborhood by renowned artist Clare Rojas. Ramekon says, "Crochet Jams engage the public to think differently about the role of art within community and the power of art within society. Crochet Jam—a public, art-making event that's embracing and inclusive, with no attempt made to dictate the creative process nor judge the finished project—is meditative, liberating, and empowering." 3/2/2017 | WE DID IT!! Nearly 250 people came together to support our Kickstarter campaign, which was successfully funded on March 2! A huge THANK YOU to everyone who donated and enabled Sites Unseen to continue and expand its programming. We will continue to work with both local and international artists to bring exciting, groundbreaking new public art and activations to San Francisco. We need your support to keep our projects going. To that end, we are excited to launch a 30-day Kickstarter campaign, with a goal of raising at least $25,000 to help create exciting new projects with the artists we love. Our next project is Love Over Rules, a large-scale neon text-based work by Hank Willis Thomas that will be installed on Annie Street between Jessie and Mission Streets, launching this spring. We're also moving forward with new commissions from Fallen Fruit, Jenny Odell, and Leah Rosenberg, as well as a continuation of Ramekon O'Arwisters' Crochet Jams, which will culminate in a permanent installation by Clare Rojas. There are some really fantastic rewards associated with our campaign, including artist-designed scarves, notebooks, posters, and Barry McGee totebags, as well as limited-edition prints and experiential opportunities. Your tax-deductible donation –– in any amount –– provides essential support to artists and enable us to expand our programming so that more members of the public can experience innovative projects for free. THANK YOU in advance for helping to bring more art to the streets of San Francisco! CLICK HERE TO SUPPORT THE PROJECT VIA KICKSTARTER! Thank you to everyone who joined us for our launch event on Sunday, October 9 on the Moscone Center Garage rooftop, featuring the Moscone Contemporary Art Centre & Garage by Barry McGee, Lemonade Stand and Endless Orchard by Fallen Fruit, Crochet Jam by Ramekon O'Arwisters, and Car Park Cake Walk by Leah Rosenberg. Please check out our GALLERY page for lots of great photos and video!